Exchange rates for the foreign currency markets are floating exchange rates. This means that the rates are not set by a government. Instead it is market forces alone which determine Forex rates of all the major currencies. The Forex rate between two currency pairs is how profit is made on currency trades. If you buy a currency while the exchange rate is low and then sell it again when the exchange rate is higher, a profit is made. Speculative trading makes up the bulk of the foreign exchange market. The exchange rate fluctuates and trades can be either long-term or short-term. In fact the Forex rates fluctuate from second to second throughout each day! All markets operate on the principle of supply and demand and the Forex market is no different. Prices go up when there are more buyers than there are sellers. Prices go down when there are more sellers than there are buyers. As traders we enjoy the tightest of bid/ask spreads on Forex rates. (The difference between the buying and selling price in the market at any point in time.) Typically the difference between the price we can buy or sell at is only 1 pip. This makes execution costs extremely small for trading cash currencies. So what determines these Forex rates? Over the long-term it is economic factors that greatly affect the Forex rates. The government’s fiscal policy and monetary policy are two main economic factors. These include the central bank policy, interest rates, and the government’s budget. If the government’s budget has a surplus or deficit, it will also affect the exchange rate because a deficit causes a negative impact. Other factors include inflation levels and trends, the trade flow between countries, or the import and export trade balances. The overall state of the country’s economic growth matters too. This is because a strong economy means that the currency is worth more. A weak economy leads to a weaker currency. Naturally, political conditions are another factor. Unstable governments and political trouble will devalue currency in that nation. Political factors are not just localised to each country. They can also include the general region or an entire group of countries. Factors that are neither economic nor political include market rumours and market expectations. Negative events that are unexpected can have a significant and very fast impact on Forex rates. These events usually fall into two categories: natural disasters or terrorism. Either can be domestic or foreign. Both can rock the markets violently and rapidly. How is currency trading for profit typically done? It is common to trade through either a broker or a market maker such as a bank or a foreign exchange trading firm. To trade in the currency market is simple. 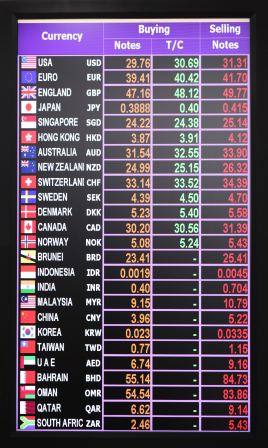 With a matrix on a computer screen showing the real-time Forex rates, a currency pair is selected, the mouse is clicked and a trade is made. Forex trading is vastly different from trading in the stock market. But it is widely used to make a profit from. Brokers who offer Forex rates typically have lower commissions than stock market brokers do. This is another reason why many traders find currency trading a lot more attractive to get into.